This infographic appeared on the People and Nature blog, Relational Thinking, to accompany a plain-language summary of an article published in People and Nature, British Ecological Society. 1(1), March 2019: pp87-102 (read the plain-language summary here). The article, Effects of climatically shifting species distributions on biocultural relationships (by Matthew Bond, Barbara Anderson, Te Hemo Ata Henare, and Priscilla Wehi) explores how climate change impacts cultural knowledge and human-nature relationships. Specifically, the research examined two plant species used for weaving and medicine by the indigenous Māori people of New Zealand. It looked at how the plants’ ranges will likely shift as a result of climate change, and compared this to where the plants are currently harvested. Although the plants themselves are not threatened by climate change, they will move away from prized harvesting areas! This could have significant impacts on access to the plants, which could in turn impact use of the plants and ultimately lead to loss of traditional knowledge. This article reminds us how important it is to consider impacts like this when studying climate change! Beavers are back! 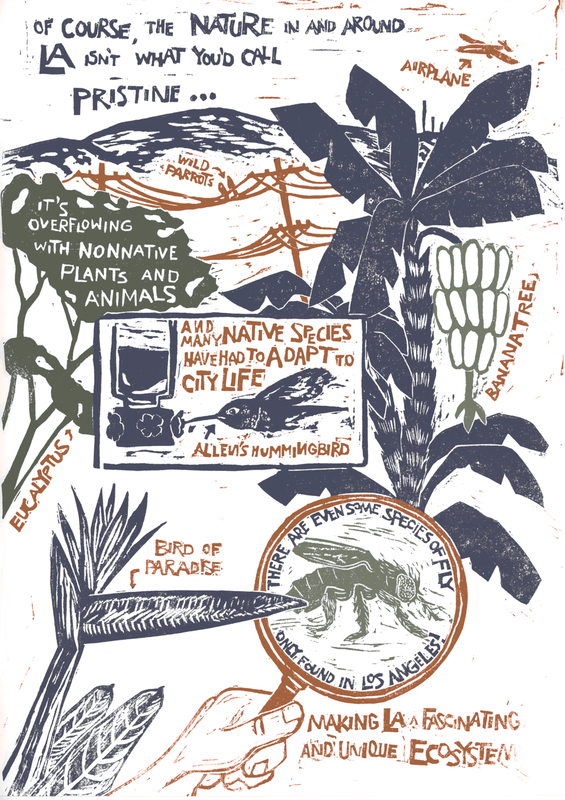 This comic, all about beaver reintroduction to the UK, is out now in The Niche, the @britishecolsoc’s amazing quarterly magazine. It’s worth becoming a member just to be able to read this magazine, it’s so chock full of wonderful articles on exciting ecology research going on in the world. And as always, I’m so honored to get to be a part of it! This comic was made in collaboration with @natasha.underwood, to serve as supplementary reading for outreach and education about beaver reintroduction. It’s a reminder of the important role that beavers play in ecosystems. Not only do they create habitat for other animals, their dams can benefit human infrastructure, too, by regulating and diminishing downstream flooding. This comic was originally published in The Niche, British Ecological Society. 50(1), March 2019: p9. 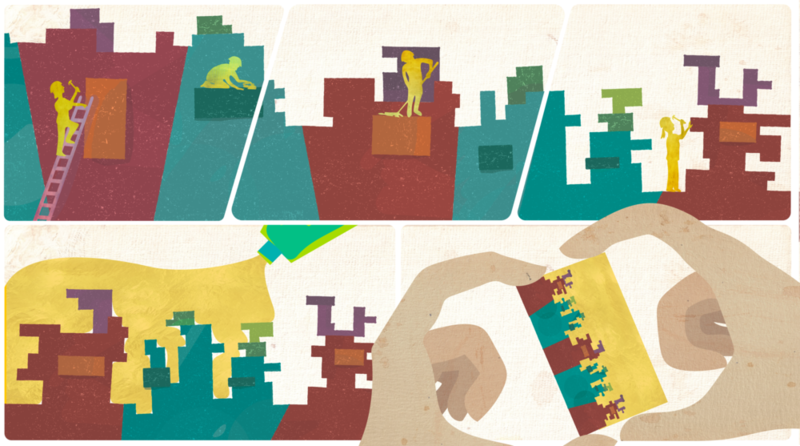 Illustrations for the Kiel University Graduate Center’s brochures. These advertise various course offerings that help graduate students learn better time management, as well as improve their study skills or learn to more effectively communicate and present their research. As always, I am 100% there for anything involving science communication! Last July, I spent a week in Palermo, Italy, exploring its green corners and creating a visual portrait of the city’s plants. The week itself was magnificent, and getting to put together this image afterwards felt like revisiting the city’s corners all over again. It felt at once hugely familiar and entirely new. The vegetation in this mediterranean environment is so similar to that in California where I grew up, a reminder of the extent to which we’ve scattered and transported our favourite plants across the globe. And of course, hearing Italian – even if I can’t understand it as well as I used to – reminds me of living in Italy as a teenager, and brings back those familiar emotions of new horizons and overcoming shyness and stumbling forward in new and unfamiliar environments. 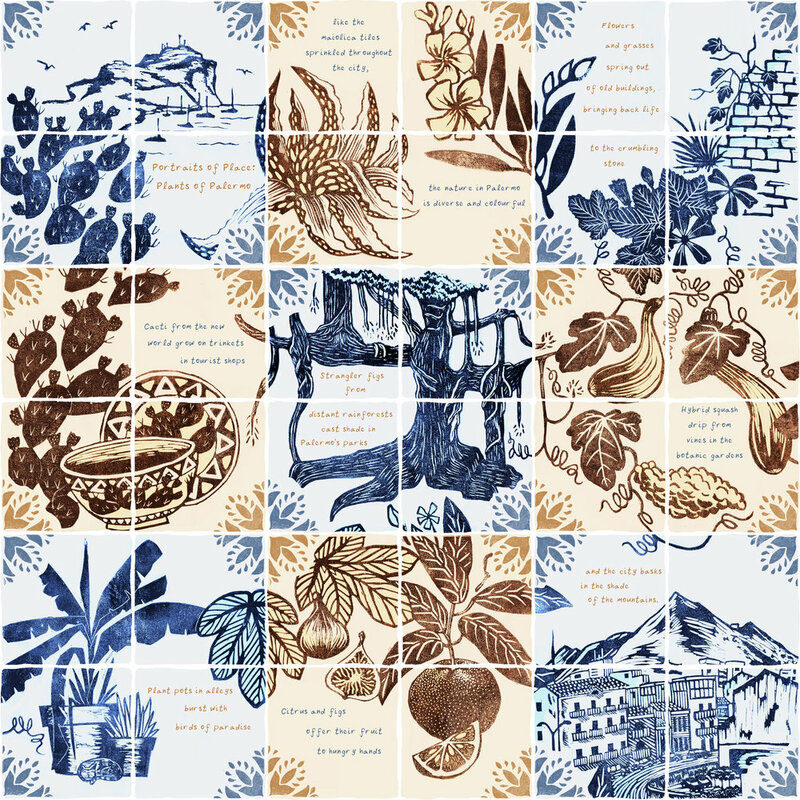 This is a continuation of my “Portraits of Place” series, and my decision to use tiles in this piece stemmed from the ubiquitousness of maiolica tiles in Palermo. The tiles both shape and reflect the city, and the images on them provide us with glimpses into the plants of Palermo during the last centuries. This is an example of some of the graphic recording I did recently at the British Ecological Society’s annual meeting in Birmingham in December 2018. I got to attend multiple sessions and workshops, including this amazing workshop about LEGO serious play (basically getting adults to take off their grown up hats, sit down on the floor in a circle, and get creative! 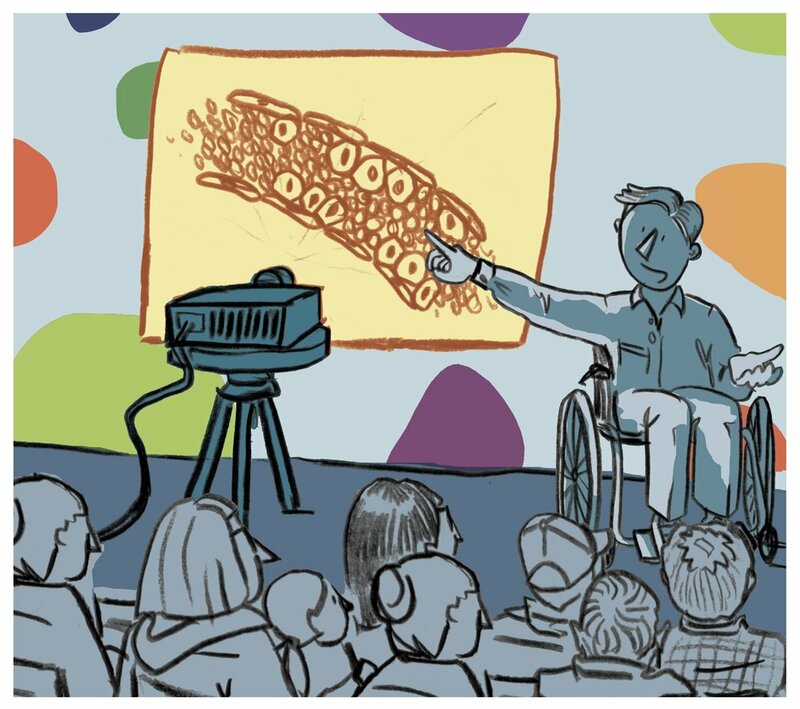 The idea is that it not only sparks creativity, but also, when structured right, creates an inclusive space where everyone has an opportunity to speak up). 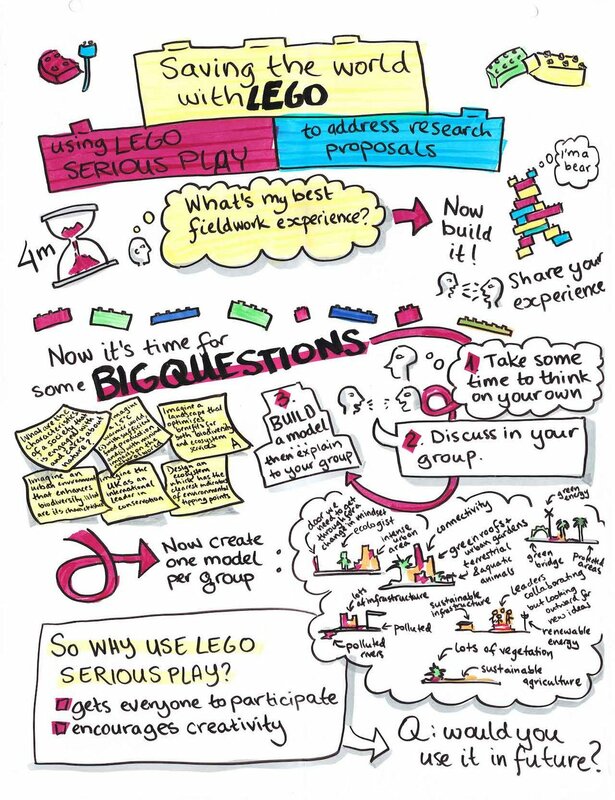 Check out the rest of the graphic recording from the conference here! Another piece for the British Ecological Society’s quarterly bulletin! This one deals with topics within conservation, and the concept of “novel ecosystems”. Are these human-modified ecosystems a valuable resource to be studied and observed? Are they symbols that we’ve allowed old ecosystems to become too modified? Should we attempt to restore old ecosystems? These are big questions that ecologists and conservationists deal with every day, and I think there’s no completely right answer. That said, I am fascinated by the idea of studying modified ecosystems, and observing how nature shapes itself around ongoing human impact. This was my second piece in Grow n’ Pains, an online zine that explores a new topic in each issue. This issue’s focus was “making it happen”, and I used the prompt to consider what pushes me get stuff done (or not). You can check out the issue here. This summer I got to design a new postcard for the M.O.I.N. programme at the CAU Graduate Center here in Kiel. M.O.I.N. 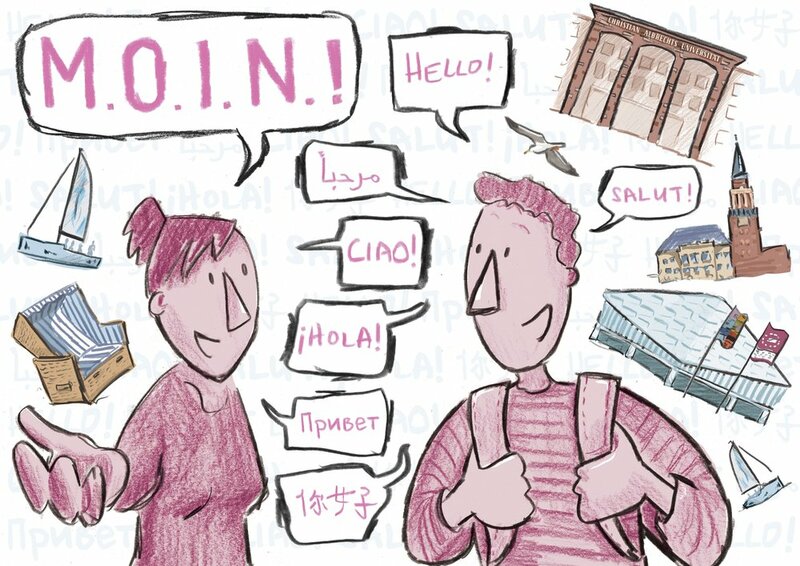 is a programme that helps organise language tandem meetings between international and german students, and can make a world of difference when you’re a slightly overwhelmed international student freshly arrived in a new city, taking on a new language and diving into a new study program. I especially enjoyed getting to write in so many languages for this! I recently got asked to do a graphic for a lecture series in Nordrhein-Westfalen on regional sustainability; you can find the graphic in its new home, as well as info about the talks here at the Landesarbeitsgemeinschaft Agenda 21 NRW website. The graphic was a lot of fun to make: it needed to contain agriculture, technology, innovation, demographic change, digitalization, ecology, and sustainable technology and development. The obvious solution? Network nodes, where each node communicated a different topic! A poster I did to promote a periodic afternoon meeting to discuss all sorts of current topics: from feminism to sustainability to queer issues to social engagement. 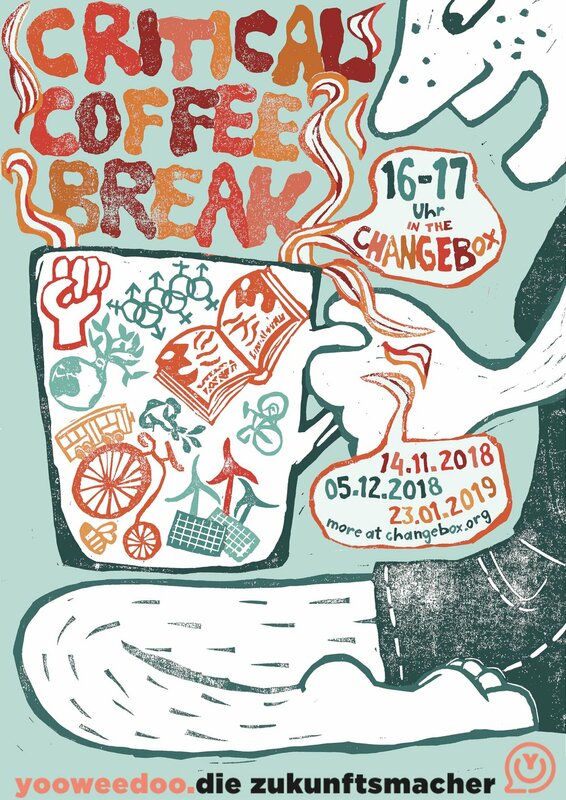 For those of you in Kiel looking for an interesting space to sit down and talk with other engaged students, check it out! My contribution to the zine “Grow n’ Pains”, which is compiled by It’s Kinda Okay. I loved thinking about what adulthood means to me, and allowing my recent time in Sweden to influence the visuals for this piece. This is a piece I did for Split Rock Review’s Autumn issue, exploring humans in nature - expectations, unexpected weather, and finding beauty inside of that! 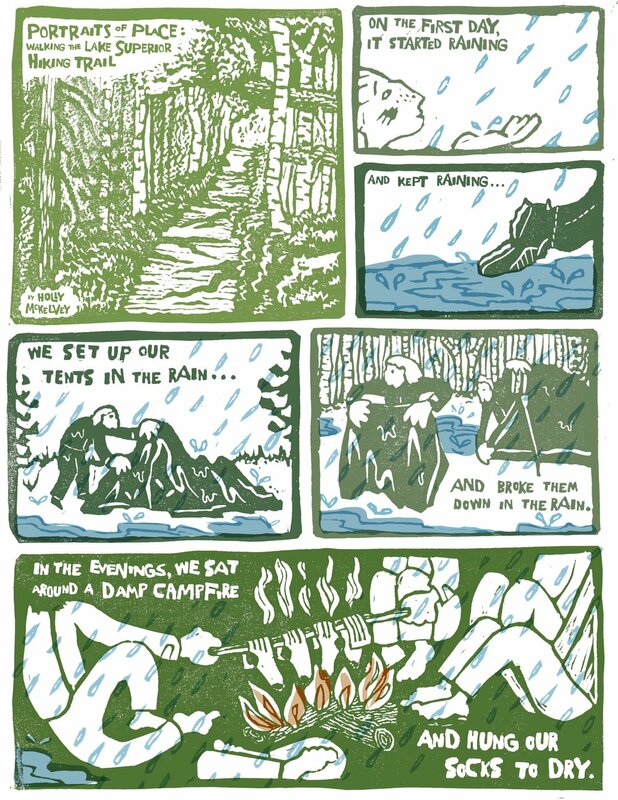 Very much based on a real camping trip on the SHT, which ended up being fabulous despite – and perhaps even because of – all the rain. 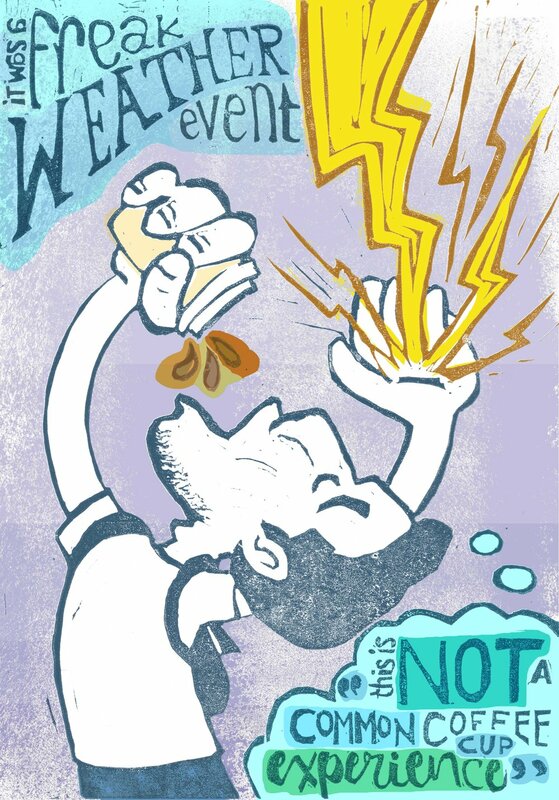 A friend of mine was in a cafe that got hit by lightning. In an interview afterwards, he uttered admirably pretentious phrases like “freak weather event” and “not a common coffee cup experience”. This lino is intended to honor that excellent interview (and the utterer of said phrases). An ode to weeds and our complicated human relationship to them, for the British Ecological Society’s September Bulletin. 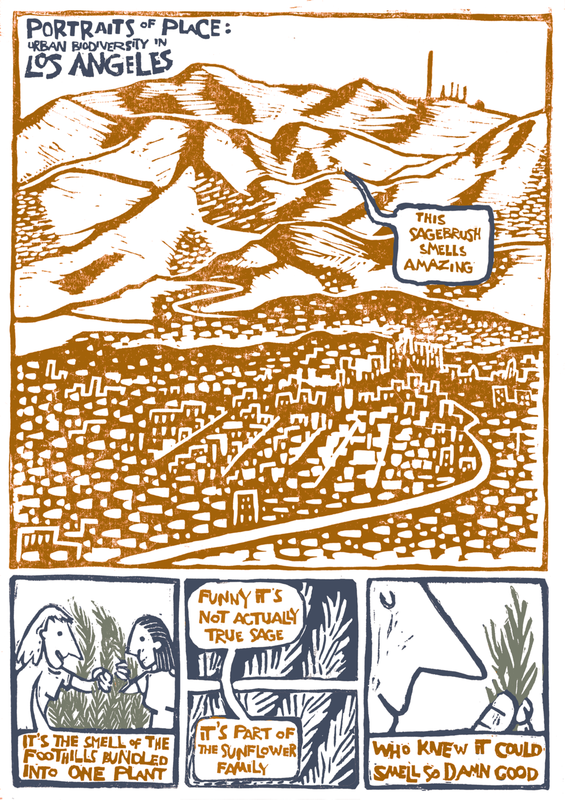 Recommended reading to accompany this comic: Weeds: How Vagabond Plants Gatecrashed Civilisation and Changed the Way We Think About Nature by Richard Mabey. I did graphic recording at the Nordic Hydrological Conference in Bergen, Norway this year - I sat in on topic sessions and keynote talks and did live “visual summaries” of the topics. This provides a fun and visual way to look back through what the conference covered, and it keeps me on my toes and makes sure I’m following along! See the rest of the my drawings from this conference here. What do you get when you lock up 13 illustrators in a room for a long weekend with the word prompt “Wunderkammer” (cabinet of curiosities), a colour palette, and the aim of putting together an anthology? Here’s my contribution from the weekend, inspired by my own collection of beautiful slender rocks from Lake Baikal. This is the first piece in a series on humans and nature. In this series I explore the in-between spaces, the places where cities spill over into the nature around them, and where nature spills right back into the cities, shaping and influencing them. These places are not wild - they are heavily influenced by humans, through the construction of roads and buildings, the introduction of new species, and the negative impacts of pollution; but equally they are surprisingly rich ecosystems, bastions of nature occupying human spaces. It is these spaces that often host some of the most interesting ecosystems, crazy ecological mishmashes of native and introduced species, which establish themselves amidst pavements and skyscrapers, and which don’t just survive, but in fact thrive within these constraints. The series will focus primarily on cities, but will also delve into natural spaces that are experiencing human influence, including issues of tourism, pollution, deveopment, and resource extraction. Page 2 in my Portraits of Place series on Los Angeles. Page 3 in my Portraits of Place series on Los Angeles. Page 4 in my Portraits of Place series on Los Angeles. Page 5 in my Portraits of Place series on Los Angeles. This is a page from a collab comic that I did together with one of my classmates in Denmark. I learned that collabs are (a) super difficult and (b) really rewarding. This page was roughly sketched by both of us, then I did basic colouring, and Mariell did the detailing (she is amazing at detailing!). Check out the rest of the comic here. At the Mikkeller Beer Celebration in Copenhagen in 2017. Excited to head back this year! This comic seems to imply that I go running with any kind of regularity. In reality, I sit around and draw about how I ought to go running, and consider that mental exercise to be sufficient. This was for a comic challenge where you draw four panels that tell a stand-alone story, and then add in an extra three that are also stand-alone, and which add another layer to the first story. My first story was quite simply me enjoying the experience of snorkeling in the tropics, but bemoaning the fact that I didn’t have my contacts in to be able to see all the colours. The second story is the shark looking up and seeing someone swimming up above - extra scary since that person has just admitted to not being able to see anything! The shark in question is a tiger shark, and although there have been reports of attacks or bites by these sharks, they are incredibly rare! For the most part sharks are either scared of humans or recognize that we’re not their normal food source. Indeed, google tiger sharks and you’ll find lovely videos of divers befriending them. So despite me using this one as a scary device, it is actually a very low risk - indeed, sharks are at far greater risk from humans than we are from them. Let’s love us some tiger sharks! 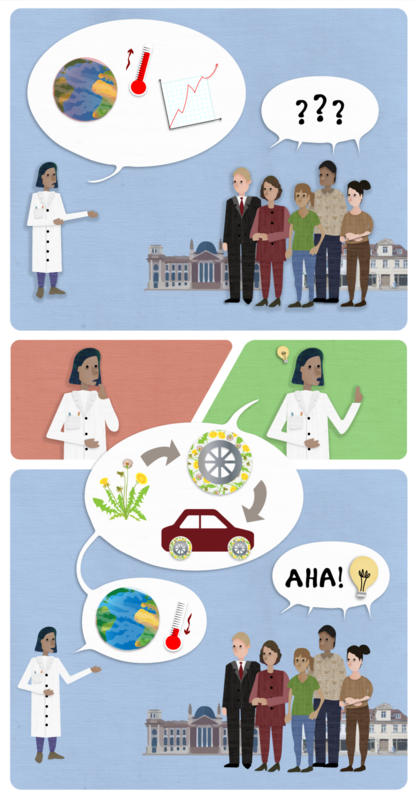 All about scicomm in the digital age - the topic of my master’s thesis! Social media, blogs, and other online spaces can turn science communication (scicomm) into kind of a ratrace, where fast news and clickbait can seem to overpower more nuanced and informative news and science information. 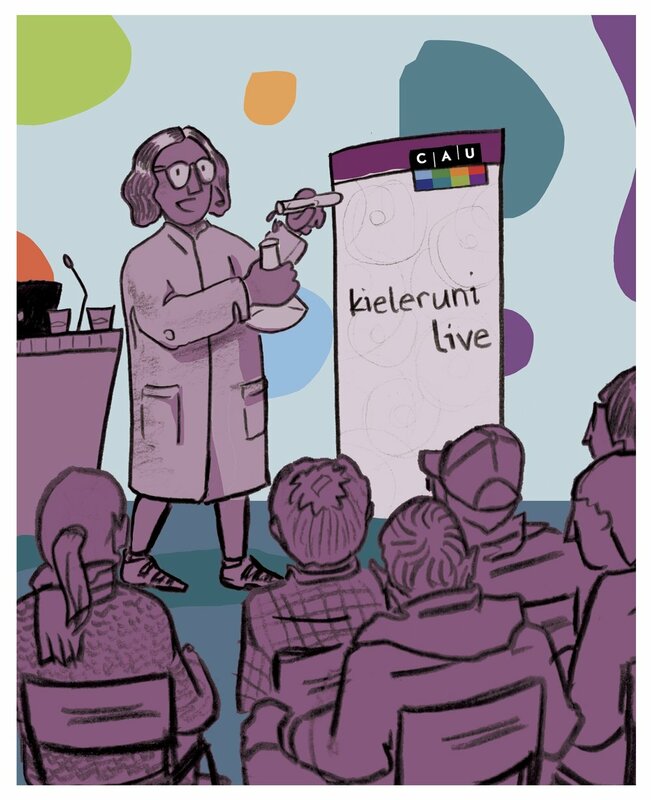 On the flip side, though, online spaces provide platforms for scientists to communicate directly about their work, for science news to reach large audiences, and for science communicators to organise real-life events like science festivals and school visits! This was for the British Ecological Society’s June Bulletin. I had so much fun drawing me into a comic where I get to talk about something I’m crazy about! 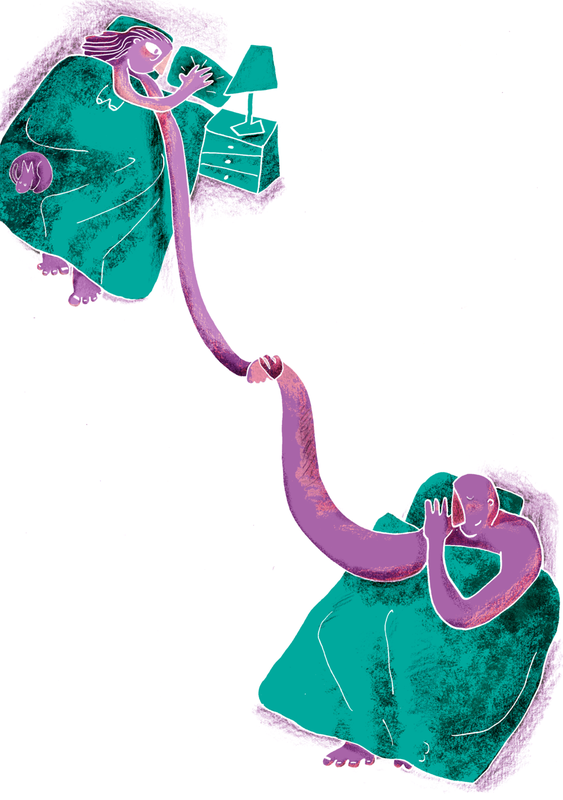 These three illustrations were for a class on editorial illustration, to accompany an article on work stress and how technology can help or hinder our work/life balance. It was my first foray into lino cuts, and I had an awesome time with it! When we talk about dinosaurs, we now divide them into “avian” dinosaurs — the ones that evolved into birds during the Jurassic, and which survived the mass extinction at the end of the Cretaceous — and “non-avian” dinosaurs — the ones who weren’t so lucky. What does that mean? All birds you see today are actually dinosaurs - the avian variety! This bird here is a Cuban tody which, according to my research, is among the most adorable avian dinosaurs out there (that’s your second bonus fact for the day). "I'll put on my new red shoes," she said… "and I'll go down to the river and ask about him." "Is it true that you have taken my little playfellow? I'll give my red shoes if you'll give him back to me." The waves, she thought, nodded in a queer fashion; so she took her gay red shoes, the most precious thing she had, and threw them both into the river, but they fell close into the bank, and the little waves carried them straight back to her on shore. It seemed that the river would not take the most precious thing she had because it had not got little Kay. 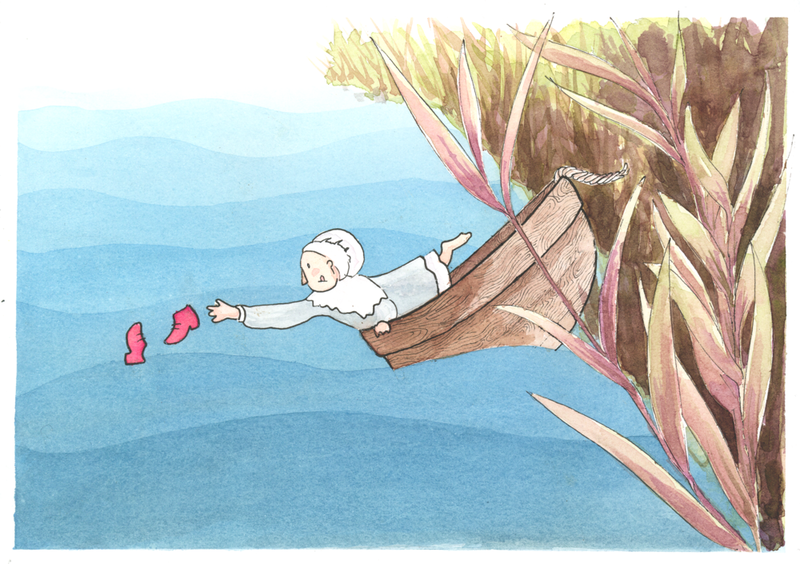 But she thought she hadn't thrown the shoes far enough out, so she climbed into a boat that lay in the rushes, and went out to the further end of it and threw out the shoes. But the boat was not moored fast, and with the movement she made it floated away from the shore. On the table were the most beautiful cherries, and Gerda ate as many as she liked, for she was allowed to; and while she was eating, the old woman combed her hair with a gold comb, and the hair curled and shone lovely and yellow about her kind little face, the round face that looked like a rose. "I've been longing for a sweet little girl like you," said the old woman, "you'll see how well we two shall get on," and all the time she was combing little Gerda's hair Gerda was forgetting more and more her foster brother Kay: for the old woman was skilled in witchcraft, but she wasn't a wicked witch, she only used witchcraft a little, for her own pleasure, and just now she wanted very much to keep little Gerda. "I'm going to go in the coach," said the little robber girl, and she must and would have her way, so spoilt and obstinate she was. She and Gerda sat in it and drove over stumps and thorn-bushes, deep into the forest. The little robber girl was as big as Gerda, but stronger, broader in the shoulders. Her eyes were quite black and had a rather sorrowful expression. She put her arm about little Gerda and said: "They shan't kill you as long as I don't get cross with you: of course, you're a Princess?" "No," said little Gerda, and told her everything that had happened to her, and how fond she was of little Kay. The robber girl looked at her very gravely and nodded her head and said: "They shan't kill you even if I do get cross with you; I'll do it myself." They got to Finmark and knocked at the Finn woman's chimney, for she hadn't a door. There was such a heat inside that the Finn woman herself went almost naked. She made haste to undo little Gerda's clothes and took off her mittens and boots, otherwise she would have been too hot. She read what was written on the cod-fish. Three times over she read it, and then knew it backwards, and she put the fish into the cooking pot, for it might just as well be eaten, and she never wasted anything. When they reached the bush with the red berries, there stood the reindeer waiting for them, and he had another young doe with him, whose udder was full, and it gave the little ones its warm milk and kissed them on the mouth. This was one of my first attempts playing with gouache. I tried to keep it simple with just two colours, and played around with layering and sponge detailing. Conclusion: gouache is a fair amount of work, but very awesome! Graphic recording at the 2017 Ecology Across Borders conference in Ghent, Belgium. I covered four topic sessions: (1) Conservation Science, (2) Rewilding, (3) Winter Ecology, and (4) People and Nature; and one of the workshops: Ecology is Fun! Designing interactive games for outreach. See the rest of my recordings here. This piece was inspired by every. bike ride. ever. that I have taken in Kiel. Ascension Island in the tropical South Atlantic is a manufactured ecosystem: an entire cloud forest worth of vegetation and fauna has been introduced by seafarers and by colonists over the last few hundred years. Despite the species having widely varying origins, they function as working ecosystem. Many ecologists look at this in horror, noting native fern species that struggle to compete in a radically new ecosystem, and citing Ascension Island as an example of how native ecosystems can be destroyed through irresponsible introduction of new species. Other ecologists look at this and see it as proof that ecosystems are spontaneous, random assemblages of species that change with time and circumstance. The success of the cloud forest on Ascension Island suggests that nature will continue to plod on with or without us, and despite our best efforts to try to conserve the ecosystems of the past. Needless to say, this is a deeply controversial topic. The idea of accepting "novel ecosystems" along with invasive species and loss or modification of familiar ecosystems is both frightening and emotionally charged. To explore this topic more, I highly recommend The New Wild by Fred Pearce, which makes a case for novel ecosystems and invasive species. You don't have to agree with him; but I'd be surprised if you don't come away from the read without some new things to think about. This piece was produced for the Unizeit in Kiel to accompany a press release on bioeconomy research: combining natural raw materials with new concepts to create more sustainable production models. As an example, using tires made out of dandelions! Find the article in English here und auf Deutsch hier. 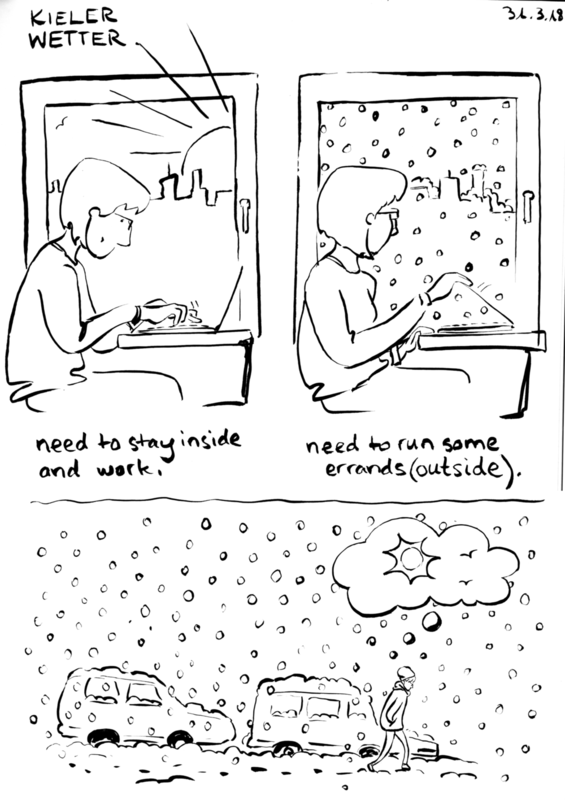 And find an animated GIF based on this strip here! This piece was produced for Unizeit issue #89 (23.Jan.2017) in Kiel, and shows the process of electro-chemically etching metal surfaces so that they can be permanently connected with other materials, based on the research of Melike Baytekin-Gerngroß, et al. Find past Unizeit issues here, and read the article itself here. And check out the animated GIF of this image here! Mönkeberg, on the Kieler Förde. A winter bike ride. A dark corner in a winding alley in beautiful Gamla Stan, the beautiful old town of Stockholm. Another winding, rainy alley in Gamla Stan. The buildings swallow you up in their palette of ochres. 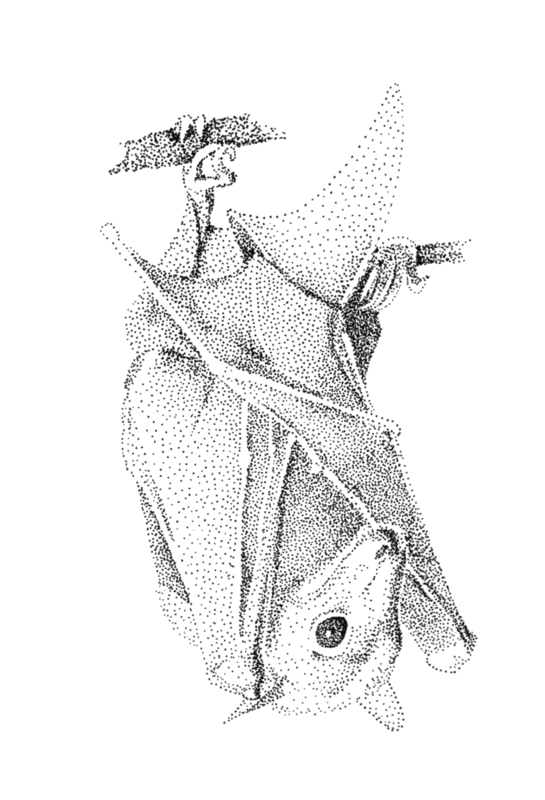 The impact of roads on bats is broad, including roadkill, noise and light pollution, and fragmentation of habitat. Backen & Schnacken is a community oven project based in Kiel, Germany; as a member of the team that created this project, I produce video and illustrations for fundraising and events. We produced this video, "Janne on the Search for Bread", to apply for funding through the Yooweedoo Changemakers Competition in February. This was my first experience doing animation, which I did with a homemade lightbox, a scanner, and Photoshop, and I absolutely loved it. Posters with my illustrations and the excellent design skills of my groupmate. The little bustard breeds in southern Europe, as well as in western and central Asia, and is the subject of an ongoing study about habitat use and movement between habitats. Here, the bird is alert, checking its surroundings. Here the little bustard moves between feeding (lowered head), resting (middle position) and alert (raised head). This study is investigating which habitats the bird uses for different behaviors, in order to better inform conservation. Agricultural areas are largely home to the little bustard; these contain open, partially vegetated, and heavily vegetated areas. A male little bustard in flight. A male little bustard walking in the resting position (not feeding, not alert). As wolves were reintroduced to Yellowstone National Park in 1995, the park's whole ecosystem began to change. Elk abandoned some of their previous grazing habitats due to the new risk of predation. Tree saplings, which had previously been eaten by grazing elk, began to grow in those areas, creating newly reforested areas in Yellowstone. Another piece for Hawkmoth Mag, exploring our bodies' physiological reactions to hot and cold. Read more here. The elegance of sedimentation, as illustrated by snow on a beach as the tide comes in on a frozen night. Confused? Read the accompanying article at Hawkmoth Mag. A diagram showing the emergence of Iceland, born from a hotspot along the spreading rift in the Atlantic Ocean, another piece for Hawkmoth Mag. Check out the article here. 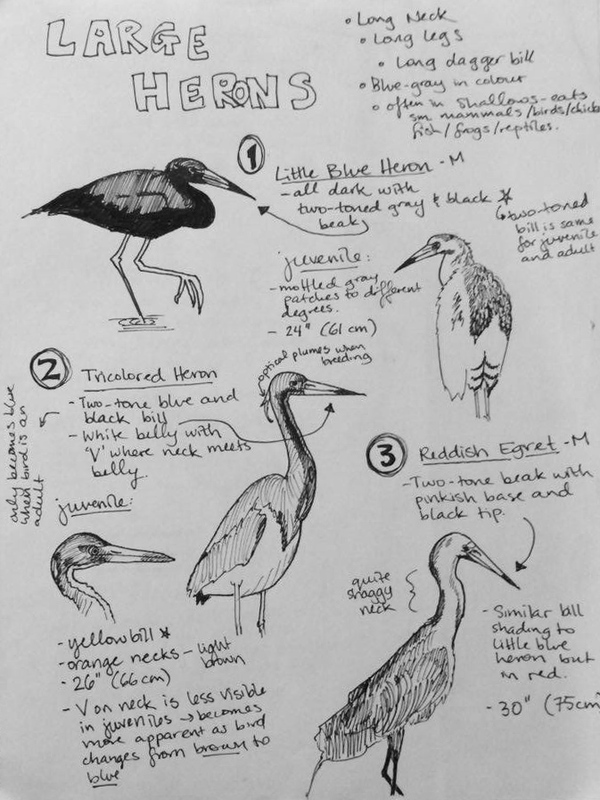 Some of the beautiful herons that inhabit the lowland canal systems of Costa Rica's NE Caribbean coast. The Great Blue Heron, which is common through much of North America, spends its winters in the humid warmth of Central American coasts. The Green Heron, meanwhile, has been spotted using bread as fish bait; in other words, this is a very clever bird. Tiger herons: the most elegant heron of the tropics. If size doesn't immediately indicate which egret you're looking at (Great Egret >>> Snow Egret >> Cattle Egret), then look at beak and leg color. This can also let you know if you're seeing an adult or a juvenile bird.